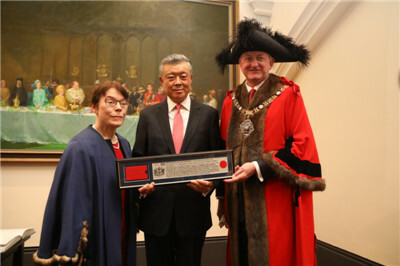 I would like to begin by expressing my appreciation to the City of London Corporation for bestowing upon me the honour of the Freedom of the City. I also wish to thank all of you who are present today for joining me on this significant occasion. Being a “Freeman” is an extremely high honour. My British friends told me that two hundred years ago, being a Freeman would have given me the privilege to “carry a naked sword in public” or “drive sheep over London Bridge”. Today, it is still a great privilege to be a City Freeman. The City of London is such an extraordinary institution. My summary of the City’s status is as simple as one, two, three, four: In a space of one square mile, the City hosts two thousand financial institutions, contributes to three percent of the UK’s GDP and manages four trillion US dollars of assets. I cherish this honour of the Freeman. I believe it is a recognition of the work of not just myself but the Chinese Embassy. It demonstrates the importance that the City of London attaches to China-UK financial cooperation. And it embodies the friendship between the people of our two countries. 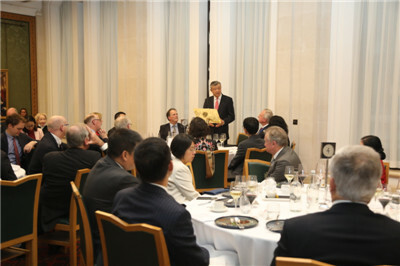 In nearly nine years as the Chinese Ambassador to the UK, I have visited the City of London numerous times. Each time, I was impressed by its profound strength and exhilarating dynamism. Each time, I could sense the enormous potential and broad prospects of China-UK financial cooperation. Such cooperation has contributed to at least three important records in our bilateral relations. First, it has achieved the greatest number of “first’s”. The UK was the first major Western country to apply to join the Asian Infrastructure Investment Bank (AIIB), the first to contribute to the AIIB special fund, and the first to sign the Guiding Principles on Financing the Development of the Belt and Road with China. The UK is also the first Western country to issue RMB sovereign bond. It is only natural that London becomes the world’s largest RMB offshore trading centre and the second largest RMB offshore clearing centre. It was in London that the Bank of China issued the first Green Covered Bond in 2016. It was at the London Stock Exchange that the Ministry of Finance of China made its first overseas issuance of RMB sovereign bond of three billion yuan. These “first’s” demonstrate the vitality of China-UK financial cooperation. They also emphasise the leading role of the financial sector in the business cooperation between our two countries. Second, of all sectors, China-UK cooperation in financial service has been most productive. This year marks the tenth anniversary of the launch of the China-UK Economic and Financial Dialogue. After ten years of strenuous efforts on both sides, EFD has become an important platform for our two countries to enhance macro policy coordination and match development strategies in the financial sector. Of the 72 outcomes of last year’s EFD, more than half are related to financial services. As of today, seven Chinese banks, including the top five state-owned commercial banks, have set up branches in London. Six of the branches were opened during my tenure as the Chinese Ambassador to the UK. The only exception, the Bank of China London Branch, was established in 1929, well before I was born. Other Chinese financial institutions, including China Re, PICC and China Taiping Insurance Group, have also set up branches in London. Moreover, the Bank of China has opened the Private Banking Service Centre in London, which is the first of its kind outside Asia. By opening these branches, the Chinese financial institutions have cast their vote of support and confidence for the City of London as Britain leaves the EU. Third, China-UK financial cooperation has the most extensive and far-reaching significance. Such significance has gone far beyond the bilateral scope. China and the UK have established the G20 Green Finance Study Group. We have issued the China-UK Strategic Plan for Financial Services. And we helped launch the China-UK Financial Services Summit led by the private sector. Through these efforts, our two countries are not only engaged in more comprehensive and strategic bilateral cooperation. We are also taking the lead in international cooperation in the financial sector. The Freedom award is an honour. This honour is based on trust. This honour imparts confidence. First, I have confidence in deeper reform and further opening up in China. This year marks the 40th anniversary of China’s reform and opening up. President Xi Jinping has reiterated on many occasions that China will not close its door; instead, it will open its door even wider to the world. The financial sector will be a key area for opening up in the next stage. China will significantly increase access to its financial market. We will work with the UK to accelerate the preparations for the Shanghai-London Stock Connect. Deeper reform and further opening up will create more business opportunities for China-UK financial cooperation at a higher level and in a wider scope. Second, I have confidence in China-UK cooperation on the Belt and Road Initiative (BRI). and showed a new direction for sustainable development in the world. As of today, more than 140 countries and international organisations have signed cooperation agreements with China on the BRI. Financial cooperation is an important part of BRI cooperation. China is encouraging the establishment of financial services platforms in the countries along the routes. The UK has extensive knowledge and expertise in international financial services, and close ties with many countries along the BRI routes. These have given the UK a unique strength in BRI project financing, Public Private Partnership, insurance and green finance. There is no doubt that the UK is a natural partner of China in advancing the BRI. Next year, China will host the second Belt and Road Forum for International Cooperation to lift international cooperation on the BRI to a new level. This will create new opportunities for China-UK cooperation, in particular, on financial services. Third, I have confidence in a sound China-UK relationship. 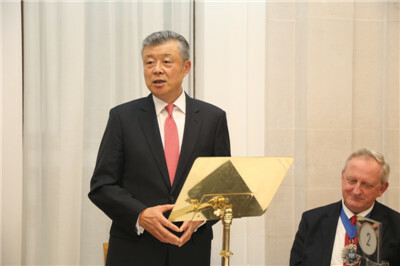 China and the UK stepped into the “Golden Era” of our relations in the second decade of the 21st century. We established the global comprehensive strategic partnership for the 21st century, and have since achieved fruitful results in our cooperation on trade, investment, financial services, science, innovation, and cultural and people-to-people exchanges. The progress has not come easy. It is a result of decades of relentless efforts of people from all walks of life of both our countries. It is important that we treasure and take good care of the sound momentum of our relationship. I hope, and I believe, that our two countries will view our relationship from a global and strategic perspective, and respect each other’s core interests and major concerns. I hope, and I believe, that China and the UK will work together to ensure the “Golden Era” remain “golden”. I believe, with firm confidence, we will overcome difficulties and strive ahead together to create an even brighter future for China-UK relations!